Almost four years after the world met the global target set in the Millennium Development Goals (MDGs) for safe drinking water, and after the UN General Assembly declared that water was a human right, over three-quarters of a billion people, most of them poor, still do not have this basic necessity, UNICEF said to mark World Water Day. The MDG target for drinking water was met and passed in 2010, when 89 per cent of the global population had access to improved sources of drinking water — such as piped supplies, boreholes fitted with pumps, and protected wells. Also in 2010, the UN General Assembly recognized safe drinking water and sanitation as a human right, meaning every person should have access to safe water and basic sanitation. However, this basic right continues to be denied to the poorest people across the world. “What continues to be striking, and maybe even shocking, is that even in middle income countries there are millions of poor people who do not have safe water to drink,” Wijesekera added. According to UNICEF and WHO estimates, 10 countries are home to almost two-thirds of the global population without access to improved drinking water sources. They are: China (108 million); India (99 million); Nigeria (63 million); Ethiopia (43 million); Indonesia (39 million); Democratic Republic of the Congo (37 million); Bangladesh (26 million); United Republic of Tanzania (22 million); Kenya (16 million) and Pakistan (16 million). 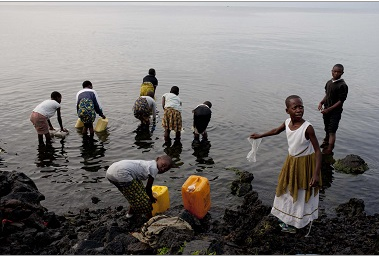 UNICEF says women and girls are disproportionately affected by lack of access to safe water. An estimated 71 per cent of the burden of drinking water collection is still being shouldered by women and girls. The team at LGF think its time to rectify this situation and want to thank all of our donors who have helped us in trying to do so to date. This entry was posted in LifeGivingForce Foundation, Stories, Uncategorized. Bookmark the permalink. Post a comment or leave a trackback: Trackback URL.